ITIL is based on quality initiatives in businesses, which find their roots in the work of Dr. W. Edwards Deming. Business students will recognize Dr. Deming as the person who revolutionized the Japanese auto industry in the 1970’s. Dr. Deming was a professor of statistics and was intimately involved in quality efforts for United States war production during WWII. He developed theories about the ability of systems to produce quality and the resultant changes in output quality that occur as changes are made within systems. He was able to demonstrate with very simple physical experiments that systems naturally reach levels of stability (equilibrium), where the system is producing the maximum level of quality that the system is capable of producing. These experiments show that when a system has reached stability, any attempts to improve quality within the system always results in increased variability of quality. He proved, statistically and experimentally, that the only way to improve quality once a system reaches stability is to change the system. Dr. Deming created a quality initiative, which proposes that workers tend to produce the maximum quality allowed by the system within which they work. Workers are naturally constrained by the system and rarely have the authority to change it. The authority to change the system rests in the hands of managers. Therefore, the managers hold responsibility for the quality output of the system. His theories included extensive use of statistics to measure the level of variability of output for any given system. The goal of his system was to drive out variability. Kaizen – the philosophy of continual improvement; that every process can and should be continually evaluated and improved in terms of time required, resources used, resultant quality, and other aspects relevant to the process. When applied to the workplace, Kaizen means continuing improvement involving everyone – managers and workers alike Kaizen is not limited to manufacturing systems only. It also means continuing improvement in personal life, home life, social life, and working life. Since 1951, Japan has yearly awarded prestigious “Deming Prizes” to companies that excel in management and production. Another mark of the esteem in which he is held in Japan can be seen in the main lobby of the Toyota headquarters building in Tokyo. Three portraits dominate the lobby, one of the company’s founder, the second of its current board chairman and the third, and largest, of Dr. Deming. One of the most impressive demonstrations of the value of this philosophy is the success of a Japanese company that was little known in the early 1970’s in this country. Today it has surpassed Ford as the second largest producer of automobiles in the world second only to General Motors. In 2002 Toyota was third worldwide in automobile production behind General Motors and Ford. That year it earned a net income per unit sold of $1,022 compared to General Motors’ loss of $17 and Ford’s loss of $141 per unit sold. 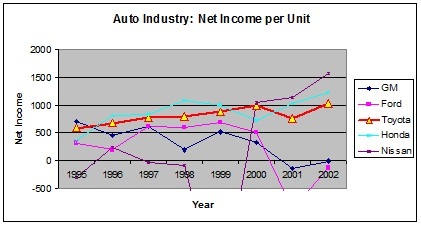 The following graphs illustrate the net income per unit for the major auto makers of the world over the period 1995 to 2002. Graph 3.1 shows the actual numbers for each year. Note that Toyota, in red, shows a consistent year after year growth with net income per unit almost doubling over this period. 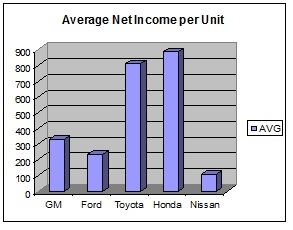 As demonstrated in Graph 3.2, the only company doing better than Toyota is Honda, which is another quality focused company that employs Dr. Deming’s ideas. ITIL builds on Dr. Deming’s philosophy and adapts it specifically to the needs of IT operations just as the Japanese adapted his philosophy to their cultural needs.